We are pleased to be providing information having submitted a full planning application. The site is located to the north of Cam and will be accessed from the A4135. Well located for easy access to the village centre, Cam and Dursley railway station and the A38 and M5 motorway. The site which has been identified by Stroud District Council as ‘brownfield’ was previously used as a plant/skip hire predominantly covered in hard standing. A listed Goods Shed is located to the north of the site, this will be retained and sympathetically integrated into the scheme. 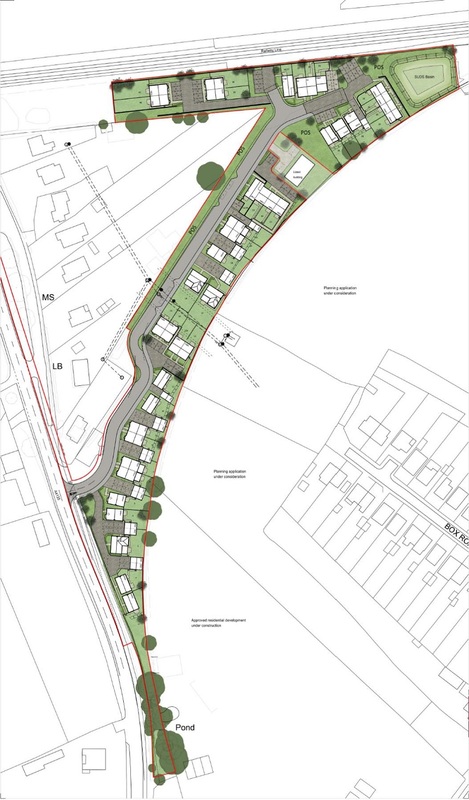 Covering an area of approximately 1.41 hectares, the site has been designed to accommodate up to 41 new houses. These will be a mix of detached and terraced houses which will present smaller, medium and larger family homes. The design of the houses has been influenced by the character of Cam and Coaley. The site previously received a resolution to grant planning permission for housing at Stroud District Council’s planning committee in December 2013, although this was not carried forward at the time. The site is listed on the Council’s ‘Brownfield Register’ so has been considered suitable for residential development.